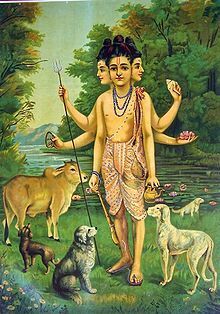 Dattatreya, Dattā or Dattaguru or Duttatreya, is a paradigmatic Sannyasi (monk) and one of the lords of Yoga in Hinduism. In many regions of India and Nepal, he is considered a deity. In Maharashtra, Andhra Pradesh, Goa, Telangana, Karnataka and Gujarat, he is a syncretic deity, considered to be an avatar (incarnation) of the three Hindu gods Brahma, Vishnu and Shiva, collectively known as Trimurti. In other regions, and some versions of texts such as Garuda Purana, Brahma Purana and Sattvata Samhita, he is an avatar of Maha Vishnu. His iconography varies regionally. In western Maharashtra and Andhra Pradesh, for example, he is typically shown with three heads and six hands, one head each for Brahma, Vishnu and Shiva, and one pair of hands holding the symbolic items associated with each member of the Trimurti: The jaapmaala and water pot of Brahma, the conch and sudarshana chakra (discus) of Vishnu, and the trishula (trident) and two headed drum of Shiva. He is popularly depicted as a reclusive and ascetical saadhu living in a forest or wilderness, suggestive of his renunciation of worldly comforts and possessions, and pursuit of a meditative yogi lifestyle. In paintings and some large carvings, he is surrounded by four dogs and a cow, the dogs are not symbols for the four Vedas but Duttaguru's teaching of similitude and equality among all creatures especially animals, right from the pure and holy cow to the dog, the least and lowest of lifeforms in Hindu thought; this exegesis was put forward by a charismatic personality, the avtari purush (godman) of the Dattatreya lineage, Shri Ramakrishna Saraswati Kshirsagar Swamiji of Ambikapur (Ahmednagar). The cow is adored and reverenced mainly in North India as a symbol of the Mother Earth who nourishes all living beings. In the temples of southern Maharashtra, Varanasi (Benares), and the Himalayas, his iconography shows him with one head and two hands, with four dogs and a cow. According to Rigopoulos, in the Nath tradition of Shaivism, Dattatreya is revered as the Adi-Guru (First Teacher) of the Adinath Sampradaya of the Nathas, the first "Lord of Yoga" with mastery of Tantra (techniques), although most traditions and scholars consider Adi Nath an epithet of Shiva. His pursuit of simple life, kindness to all, sharing of his knowledge and the meaning of life during his travels is reverentially mentioned in the poems by Tukaram, a saint-poet of the Bhakti movement. Over time, Dattatreya has inspired many monastic movements in Shaivism, Vaishnavism and Shaktism, particularly in the Deccan region of India, south India, Gujarat, Rajasthan and Himalayan regions where Shiva tradition has been strong. According to Mallinson, Dattatreya is not the traditional guru of the Nath Sampradaya, he was coopted by the Nath tradition in about the 18th century as a guru, as a part of Vishnu-Shiva syncretism. This is evidenced by the Marathi text Navanathabhaktisara, states Mallinson, wherein there is syncretic fusion of the Nath Sampradaya with the Mahanubhava sect by identifying nine Naths with nine Narayanas. Several Upanishads are dedicated to him, as are texts of the Advaita Vedanta-Yoga tradition in Hinduism. One of the most important texts of Advaita Vedanta, namely Avadhuta Gita (literally, "song of the free") is attributed to Dattatreya. Annual festival in the Hindu calendar month of Mārgaśīrṣa (November/December) reveres Dattatreya and this is called Datta Jayanti. The puranic stories of Dattatreya are diverse and vary by region. In the Puranas, he was born in north Indian hermitage to Anusuya and her husband the Vedic sage Atri traditionally credited with making the largest contribution to the Rigveda. Another states his father lived in the western Deccan region. A third claims he was born in Kashmir jungles near the sacred Amarnath Temple. A fourth legend states he was born along with his brothers Durvasa and Chandra, to an unwed mother named Anusuya, after sage Atri saw her bathing, fantasized about her which caused her to become pregnant. In a fifth myth, sage Atri was very old when young Anusuya married him and they sought the help of the trimurti gods for a child. As the trinity were pleased with them for having brought light and knowledge to the world, instantly granted the boon, which led Dattatreya to be born with characteristics of all three. While his origins are unclear, stories about his life are more clearer. He is described in the Mahabharata as an exceptional Rishi (sage) with extraordinary insights and knowledge, who is adored and raised to a Guru and an Avatar of Vishnu in the Puranas. Dattatreya is stated in these texts to having renounced the world and leaving his home at an early age to lead a monastic life. One myth claims he meditated immersed in water for a long time, another has him wandering from childhood and the young Dattatreya footprints have been preserved on a lonely peak at Girnar (Junagadh, Gujarat). The Tripura-rahasya refers to the disciple Parasurama finding Dattatreya meditating on Gandhamadana mountain. Dattatreya is said to have his lunch daily by taking alms at a holy place Pithapuram, Andhra Pradesh, where he was born as Sripada Sri Vallabha (his first avatar). Dattatreya's iconography varies with region. Left: Icon with three heads; Right: with one head. The appearance of Shri Dattatreya in pictures varies according to traditional beliefs. A typical icon for Dattatreya, particularly popular with Marathi-speaking people in India, has three heads corresponding to Brahma-Vishnu-Shiva, and six hands; the lowest two hands carry rosary (mala) and water pot (kamandalu), middle pair of hands hold hourglass mini-drum (damaru) and trident (trishul), and top two hands have conch (shankh) and spinning wheel (chakra). Many older medieval temples of Dattatreya show him with just one head, such as the one in Mahur and another in Pandharpur, both in southern Maharashtra. Texts such as Agni Purana describe the architectural features for building murti, and for Dattatreya, it recommends him with one head and two hands. In Varanasi, Nepal, north Himalayan foothill states of India, 15th-century Nath temples of Dattatreya show him with just one face. In western parts of Maharashtra, the syncretic six armed and three faced iconography is more common. Furthermore, the unfolding of the Dattātreya icon illustrates the development of Yoga as a synthetic and inclusive body of ideologies and practices. Although fundamentally a jñāna-mūrti, Dattātreya is a "honey bee" Yogin: one whose character and teachings are developed by gathering varieties of Yoga's flowers. For all religious groups whose propensity it is to include ideas, practices, and teaching from the ocean of traditions, Dattātreya is truly a paradigm. Another distinctive aspect of Dattatreya iconography is that it includes four dogs and a cow. The four dogs represent the Vedas, as trustworthy all weather friends, company and guardians, while the cow is a metaphor for mother earth who silently and always provides nourishment. Dattatreya's sculptures with alternate iconography have been identified in 1st millennium CE cave temples and archaeological sites related to Hinduism. For example, in the Badami temple (Karnataka), Dattatreya is shown to be with single head and four hands like Vishnu, but seated in a serene Yoga posture (padmasana). Carved with him are the emblems (lañchana) of the Trimurti, namely the swan of Brahma, the Garuda of Vishnu and the Nandi of Shiva. The right earlobe jewelry and hair decoration in this art work of Dattatreya is of Shiva, but on his left the details are those of Vishnu. Rigopoulos dates this Badami sculpture to be from the 10th to 12th century. A sculpture similar to Badami, but with some differences, has been discovered in Ajmer (Rajasthan). The Ajmer art work is a free statue where Dattatreya is standing, has one head and four hands. In his various hands, he carries a Trishula of Shiva, a Chakra of Vishnu, a Kamandalu of Brahma, and a rosary common to all three. Like the Badami relief work, the Ajmer iconography of Dattatreya shows the swan of Brahma, the Garuda of Vishnu and the Nandi of Shiva carved on the pedestal with him. Some scholars such as James Harle and TA Gopinatha Rao consider iconography that presents Brahma-Vishnu-Shiva together as Hari Hara Pitamaha to be synonymous with or equivalent to Dattatreya. Antonio Rigopoulos questions this identification, and suggests that Harihara Pitamaha iconography may have been a prelude to and something that evolved into Dattatreya iconography. Always be learning The investigators of the true nature of the world are uplifted by their own efforts in this world. The self is the infallible guide of the self: through direct perception and through analogy one can work out one's salvation. The historic Indian literature has interpreted the representation of Dattatreya symbolically. His three heads are symbols of the Gunas (qualities in Samkhya school of Hinduism). The three Gunas are Sattva, Rajas and Tamas. The six hands have ethical symbolism, namely Yamas, Niyama, Sama, Dama, Daya and Shanti (axiology in Yoga and Vedanta school of Hinduism). The Kamadhenu cow is symbolic Panchabutas, the four dogs are inner forces of a human being: Iccha, Vasana, Asha and Trishna. In these interpretations, Dattatreya is that yogi Guru (teacher) who has perfected all these, rules them rather than is ruled by them, and is thus the Guru Dattatreya is beyond them. The Dattatreya Upanishad (tantra-focussed), Darshana Upanishad (yoga-focussed) and particularly the Avadhuta Upanishad (advaita-focussed) present the philosophy of the Dattatreya tradition. Dattatreya is also mentioned in the classic text on Yoga, the Shandilya Upanishad. Other Upanishads where Dattatreya's name appears in lists of ancient Hindu monks revered for their insights on renunciation are Jabala Upanishad, Naradaparivrajaka Upanishad, Bhikshuka Upanishad and Yajnavalkya Upanishad. Of these, his mention in the Jabala Upanishad is chronologically significant because this ancient text is dated to have been complete between the 3rd century BCE and 3rd century CE. Dattatreya is mentioned in the Mahabharata and the Ramayana. Dattatreya is mentioned in the ancient chapter 9 of the Sattvata Samhita and chapter 5 of the Ahirbudhnya Samhita, both among the oldest layer of texts in the Vaishnava Agama tradition (Pancaratra). Schrader states these texts and the chronology of Dattatreya are older than the Mahabharata, but Rigopoulos disagrees with him on the chronology. In the Hindu tradition, Dattatreya is the author of Avadhuta Gita, or the "Song of the free". The text's poetry is based on the principles of Advaita Vedanta, one of the subschools of Hindu philosophy. The extant manuscripts have been dated to approximately the 9th or 10th century, but it may have existed earlier as part of an oral tradition. It consists of 289 shlokas (metered verses), divided into eight chapters. Nath sampradaya: The Nath yogis, that metamorphosed into a warrior ascetic group, consider Dattatreya as their theological founder. This group grew and became particularly prominent during the Islamic invasions and Hindu-Muslim wars in South Asia, from about the 14th to 18th century, although the Dattatreya roots of the peaceful Nath yogis go back to about the 10th century. The group was most active in Rajasthan, Gujarat, Maharashtra, Madhya Pradesh, Uttar Pradesh and Nepal. The tradition believes that the legendary Nath sampradaya yogi and Hatha Yoga innovator Gorakshanath was inspired and shaped by Dattatreya. Regional efforts and texts of the Nath tradition such as Yogi sampradaya vishkriti discussed Dattatreya. Avadhuta sampradaya: The nine Narayanas of the Avadhuta sampradaya are attributed to Dattatreya, an idea also found in the Natha sampradaya. A panth started by Pantmaharaj Balekundrikar of Balekundri near Belgavi is related to this. Dasanami sampradaya and Shakti pithas: Dattatreya is revered in Dasanami and goddess-oriented Shaktism traditions. Bhakti traditions: Dattatetreya's theology emphasizing simple life, kindness to all, questioning the status quo, self pursuit of knowledge and seeking spiritual meaning of life appealed to Bhakti sant-poets of Hinduism such as Tukaram and Eknath, during an era of political and social upheavel caused by Islamic invasion in the Deccan region of India. They reverentially mentioned Dattatreya in their poems. The use of his symbolism was one of the many syncretic themes of this period where the ideas of Vaishnavism and Shaivism holistically fused in popular imagination. Mahanubhava tradition: Along with Krishna, the Mahanubhava tradition considers Dattatreya as their divine inspiration. The Mahanubhava Panth, propagated by Sri Chakradhar Swami, has five Krishnas, of which Dattatreya is one as their Adi Guru (the original Guru), as well as the early teachers in their tradition (Chakradhar, Gundham, Cangdev). They worship Dattatreya as single headed with two arms. He has a temple dedicated in Mahur by this tradition. Gurucharitra tradition: This tradition is named after the Marathi text Gurucharitra consisting of 51 chapters, containing the life stories of 14th-century Sripada Srivallabha and 15th-century Narasimha Saraswati. The text was composed by Sarasvati Gangadhara, consists of three sections called Jnanakanda (chapters 1–24), Karmakanda (25–37) and Bhaktikanda (38–51), and is considered a sacred mantra-filled text in the Gurucharita tradition in parts of Maharashtra, north Karnataka and Gujarat. Gangapur in north Karnataka is an important pilgrimage center in this tradition. Lal Padris: another Hindu yogi group from western India with roots in the 10th-century and with ideas similar to Nath and Kanphata sampradaya, traces Dattatreya as the basis of their spiritual ideas. Around 1550 CE, Dattatreya Yogi taught the Dattatreya philosophy to his disciple Das Gosavi in Marathi. Das Gosavi then taught this philosophy to his two Telugu disciples Gopalbhatt and Sarvaved who studied and translated Das Gosavi's book of Vedantavyavaharsangraha into Telugu language. According to Prof. R. C. Dhere, Dattatreya Yogi and Das Gosavi are the original gurus in the Telugu Dattatreya tradition. Prof. Rao states that Dattatreya Shatakamu was written by Paramanandateertha who is equally important in his contributions to the Telugu tradition of Dattatreya. He was a proponent of Advaita philosophy and dedicated his two epics, Anubhavadarpanamu and Shivadnyanamanjari to Shri Dattatreya. His famous Vivekachintamani book was translated into Kannada by Nijashivagunayogi and Lingayat saint Shanatalingaswami translated this into Marathi. Numerous Datta temples exists in Maharashtra; Mahur, Nanded district. Ek Mukhi Datta of Narayanpur features Dattatreya. There is a temple of Lord Dattatreya in Devgad (deogad) of Ahmednagar district. There is a temple of lord Dattatreya, amidst the serene and quiet natural surroundings of the Vanki River, at the village of Pathari, 7 km from Valsad city, Gujarat, and 3 km from the highway to Dharampur. Another ancient temple of Lord Dattreya in Pulgaon in Wardha district in the Indian state of Maharashtra on the bank of the Wardha River. 15th-century Dattatreya temple in Bhaktapur, Nepal. Iconography at its entrance includes depictions of Vishnu's conch and Shiva's trident. Inside is a Dattatreya icon with one face and two hands, revered on Maha Shivaratri and considered as the healing deity. The square is surrounded by Hindu monasteries. Shri Dattatreya Temple, Bijalpur, Indore, M.P. ^ "Sri Duttatreya (Raja Ravi Varma)". ^ a b James G. Lochtefeld (2002). The Illustrated Encyclopedia of Hinduism: A-M. The Rosen Publishing Group. p. 176. ISBN 978-0-8239-3179-8. ^ a b c d e f g h Maxine Berntsen (1988). The Experience of Hinduism: Essays on Religion in Maharashtra. State University of New York Press. pp. 95–96. ISBN 978-0-88706-662-7. ^ Rigopoulos 1998, pp. 42-43. ^ a b c Rigopoulos 1998, pp. 224–226. ^ Rigopoulos (1998), p. 77. ^ Harper & Brown (2002), p. 155. ^ Maxine Berntsen (1988). The Experience of Hinduism: Essays on Religion in Maharashtra. State University of New York Press. pp. 96–106. ISBN 978-0-88706-662-7. ^ Mallinson 2012, pp. 407–411. ^ Antonio Rigopoulos (1998). Dattatreya: The Immortal Guru, Yogin, and Avatara: A Study of the Transformative and Inclusive Character of a Multi-faceted Hindu Deity. State University of New York Press. pp. 57–68. ISBN 978-0-7914-3696-7. ^ a b Dalal 2010, p. 50. ^ a b K P Gietz 1992, p. 58 note 318. ^ a b Antonio Rigopoulos (1998). Dattatreya: The Immortal Guru, Yogin, and Avatara. State University of New York Press. pp. 1–3. ISBN 978-0-7914-3696-7. ^ Mandeep (March 2013). "Who is Lord Dattatreya". ^ a b Antonio Rigopoulos (1998). Dattatreya: The Immortal Guru, Yogin, and Avatara. State University of New York Press. pp. 6–7. ISBN 978-0-7914-3696-7. ^ Antonio Rigopoulos (1998). Dattatreya: The Immortal Guru, Yogin, and Avatara. State University of New York Press. pp. 8–11. ISBN 978-0-7914-3696-7. ^ Antonio Rigopoulos (1998). Dattatreya: The Immortal Guru, Yogin, and Avatara. State University of New York Press. pp. 27–28. ISBN 978-0-7914-3696-7. ^ Mahendranath, Shri Gurudev. "The Pathless Path to Immortality: The Wisdom of Bhagavan Dattatreya" in The Scrolls of Mahendranath, International Nath Order, 2002. Retrieved December 17, 2010. ^ a b c Antonio Rigopoulos (1994). Dattatreya: The Immortal Guru, Yogin, and Avatara: A Study of the Transformative and Inclusive Character of a Multi-faceted Hindu Deity. State University of New York Press. pp. 40–57. ISBN 978-1-4384-1733-2. ^ Antonio Rigopoulos (1994). Dattatreya: The Immortal Guru, Yogin, and Avatara: A Study of the Transformative and Inclusive Character of a Multi-faceted Hindu Deity. State University of New York Press. pp. 57–58. ISBN 978-1-4384-1733-2. ^ a b Klaus K. Klostermaier (2007). A Survey of Hinduism: Third Edition. State University of New York Press. p. 478. ISBN 978-0-7914-7082-4. ^ Rigopoulos 1998, pp. 223–224. ^ Rigopoulos 1998, p. 224. ^ Antonio Rigopoulos (1994). Dattatreya: The Immortal Guru, Yogin, and Avatara: A Study of the Transformative and Inclusive Character of a Multi-faceted Hindu Deity. State University of New York Press. pp. xiv, 228–237. ISBN 978-1-4384-1733-2. ^ a b Rigopoulos 1998, pp. 227-228. ^ T. A. Gopinatha Rao (1993). Elements of Hindu iconography. Motilal Banarsidass. pp. 252–255. ISBN 978-81-208-0878-2. ^ a b T. A. Gopinatha Rao (1993). Elements of Hindu iconography. Motilal Banarsidass. pp. 251 (figure 2), 255. ISBN 978-81-208-0878-2. ^ James C. Harle (1994). The Art and Architecture of the Indian Subcontinent. Yale University Press. p. 236. ISBN 978-0-300-06217-5. ^ T. A. Gopinatha Rao (1993). Elements of Hindu iconography. Motilal Banarsidass. pp. 238, 252–253. ISBN 978-81-208-0878-2. ^ Rigopoulos 1998, pp. 227–228. ^ a b Antonio Rigopoulos (1994). Dattatreya: The Immortal Guru, Yogin, and Avatara: A Study of the Transformative and Inclusive Character of a Multi-faceted Hindu tradition Deity. State University of New York Press. pp. 243 footnote 40. ISBN 978-1-4384-1733-2. ^ Rigopoulos 1998, pp. 64–71, 223. ^ Olivelle 1992, pp. 273–277. ^ Larson, Gerald James; Bhattacharya, Ram Shankar (2008). Yoga : India's Philosophy of Meditation. Motilal Banarsidass. p. 608=harv. ISBN 978-81-208-3349-4. ^ Rigopoulos 1998, p. 57. ^ Olivelle 1992, pp. 145, 184, 237, 278–280 (see first three sections). ^ Olivelle 1992, pp. 5–11. ^ a b Rigopoulos 1998, p. 43. ^ a b Rigopoulos 1998, p. 195. ^ John A. Grimes (1996). A Concise Dictionary of Indian Philosophy: Sanskrit Terms Defined in English. State University of New York Press. p. 110. ISBN 978-0-7914-3067-5. ^ Rigopoulos 1998, pp. 195–196. ^ a b Joshi, Dr. P. N. (2000) Shri Dattatreya Dnyankosh. Pune: Shri Dattatreya Dnyankosh Prakashan. ^ a b Rigopoulos 1998, pp. 99–104, 218. ^ Karine Schomer; W. H. McLeod (1987). The Sants: Studies in a Devotional Tradition of India. Motilal Banarsidass. pp. 220–221. ISBN 978-81-208-0277-3. ^ David N. Lorenzen; Adrián Muñoz (2011). Yogi Heroes and Poets: Histories and Legends of the Naths. State University of New York Press. pp. 59–61. ISBN 978-1-4384-3892-4. ^ Rigopoulos 1998, p. 99. ^ Rigopoulos 1998, pp. xiii, 89, 94–95. ^ Raeside, I. M. P. (1982). "Dattātreya". Bulletin of the School of Oriental and African Studies. 45 (03): 489–499. doi:10.1017/S0041977X00041537. ^ Karine Schomer; W. H. McLeod (1987). The Sants: Studies in a Devotional Tradition of India. Motilal Banarsidass. pp. 95–102, 220–221. ISBN 978-81-208-0277-3. ^ Karine Schomer; W. H. McLeod (1987). The Sants: Studies in a Devotional Tradition of India. Motilal Banarsidass. pp. 215–224. ISBN 978-81-208-0277-3. ^ Antonio Rigopoulos (2005). The Mahanubhavs. Firenze University Press. pp. 9–10. ISBN 978-88-8453-264-0. ^ Rigopoulos 1998, pp. 223-224. ^ a b Antonio Rigopoulos (1993). The Life And Teachings of Sai Baba of Shirdi: The Conflicting Origins, Impacts, and Futures of the Community College. State University of New York Press. pp. 18, 29 note 12, 269–272. ISBN 978-0-7914-1267-1. ^ George Weston Briggs (1998). Gorakhnāth and the Kānphaṭa Yogīs. Motilal Banarsidass. pp. 74–75. ISBN 978-81-208-0564-4. ^ Works relating to the Dattatreya Cult in Telugu Literature: N. Venkata Rao (Essays in Philosophy presented to Dr. T. M. P. Mahadevan, Madras, 1962. pp464-475). ^ "Valsad District Panchayat - About District - History". valsaddp.gujarat.gov.in. Abhayananda, S., Dattatreya's Song of the Avadhut. ATMA Books (Olympia, Wash), 2000. ISBN 81-7030-675-2. Hariprasad Shivprasad Joshi (1965). Origin and Development of Dattātreya Worship in India. The Maharaja Sayajirao University of Baroda. Harper, Katherine Anne; Brown, Robert L. (2002). The Roots of Tantra. New York: State University of New York Press. ISBN 978-0-7914-5305-6. Kambhampati, Parvathi Kumar (2000). Sri Dattatreya (1st ed.). Visakhapatnam: Dhanishta. Rigopoulos, Antonio (1998). Dattatreya: The Immortal Guru, Yogin, and Avatara. New York: State University of New York Press. ISBN 0-7914-3696-9. Subramanian K. N., Wisdom of Sri Dattatreya. Sura Books, 2006. ISBN 81-7478-390-3. Hattangadi, Sunder (2000). "अवधूतोपनिषत् (Avadhuta Upanishad)" (PDF) (in Sanskrit). Retrieved 4 March 2016. Olivelle, Patrick (1993). The Asrama System. Oxford University Press. ISBN 978-0195083279. Wikimedia Commons has media related to Dattatreya.